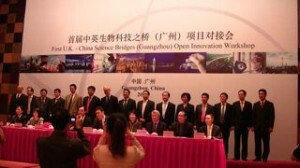 What is Science Bridges China? Day 1 of the Open Innovation Workshop was opened by the Chairman of the Administrative Committee of Guangzhou Development District to an audience of over 300 people at the Crowne Plaza hotel in Guangzhou. 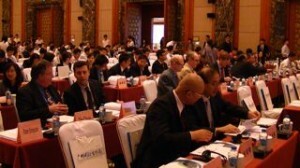 Following a signing ceremony by the International Industrial Alliance, all the UK and Chinese workshop participants presented their science and invited other workshop attendees to express interest in collaborating with them. These expressions were captured and will be used in the closed door workshop meetings in the following days.